Maestro Mark Sforzini dispels notions of opera being too stuffy or boring. The affable conductor, composer and director of the St. Petersburg Opera hosts amusingly informative events that de-snobify the genre. His Evenings and Mornings with the Maestro and the cheeky Opera Therapy series offer explanations, conversations and mini-performances that shed light on storylines, history and an opera’s musical dynamics, all in a casual setting. Since joining the opera in 2005, the “Modern Day Renaissance Man” has spearheaded the opening of Opera Central on First Avenue South, which presents satellite events and art shows that foster a mutually beneficial relationship between SPO and the downtown community. Sforzini told Creative Pinellas during a recent Q&A to expect more of SPO’s informative fun. The Maestro and Therapy events will not only continue at the Music Gallery and the Museum of Fine Arts, but four Afternoons with the Maestro will be added at Peace Memorial Church in downtown Clearwater. Plus, four Cocktails with the Maestro events are scheduled for the Iberian Rooster in downtown St. Pete. Engaging youth has become a priority for Sforzini, who knows firsthand the benefits of learning music during childhood. He also has a healthy appreciation of all forms of music. The native Alabaman first played piano and took up the saxophone in seventh grade in the band program. In the ninth grade, the band director recruited him to play the bassoon in the concert band — which he would play later with The Florida Orchestra. 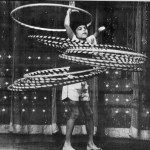 Sforzini also chats up what keeps him here in Tampa Bay, SPO’s upcoming Tales of Hoffmann, how his family life influenced him and what it would take to get him to perform on the Hula Hoop again. With your credentials, you could work just about anywhere? Why have you chosen to stay here in Tampa Bay instead of relocating to another metropolitan area? I have such deep roots in the community dating all the way back to moving here in 1992 to join the Florida Orchestra as principal bassoonist. It’s hard to imagine going anywhere else. It’s always fun to travel somewhere to do some guest conducting, but other than that, I have no plans to leave this wonderful area. Over the past 25 years, we’ve witnessed amazing growth in the arts scene which is rich and diverse and attracts an enthusiastic and supportive audience. My vision is focused on making things better and better here rather than looking for alternative opportunities elsewhere. I’m fortunate to be able to conduct both the St. Petersburg Opera and Tampa Bay Symphony, which gives me the opportunity to create both opera and symphonic concerts. A lot of conductors don’t get to do both of those on a regular basis. It would seem that working with the Tampa Bay Symphony flexes a different creative muscle than your work with the St. Petersburg Opera. Definitely. Opera has the story, singers, and all the theatricality of the drama, sets, lighting and costumes. … When you are truly immersed as an audience member in the operatic experience, all the elements just blend together in one tremendous overall understanding. When conducting the TBS, the orchestra players themselves take centerstage. Of course, you can watch the conductor and the musicians playing their instruments and notice what people are wearing, but the majority of emphasis is on the sound and music itself. Also, the St. Pete Opera engages professionals in all performing, directing and theatrical positions. The TBS is made up of very dedicated and talented volunteers. Each exercises different creative muscles for me to bring about the best results, and I love working with both groups. Opera Therapy is an ingenious cultural event concept. I love the idea of you bringing up ego and interpersonal issues with opera performers in character. Will you continue the event? What kind of feedback have you received? This season’s “Couples Therapy” program followed individual character therapy the previous two seasons. The performers and I really had a lot of fun with this program and the audience feedback was great. We are thinking of scheduling an encore performance of the Couples Therapy program next season at Opera Central. … The November 2017 program is entitled “Bad Boys and the Girls that Can’t Resist Them.” We are going to have a lot of fun with that theme. Opera is driven by the story, and everyone enjoys a good story. I do my best to present the plot and characters in real, down-to-earth terms, often with some humor thrown in, and to also point out things to listen for in the music. If I can make modern day analogies about a 200 year old opera, I do. There’s so much to love about opera, and I want to share it with as many people as possible. One thing I love about opera, especially Puccini, is the portrayal of strong, leading women. Madama Butterfly, Tosca and so many others give us fierce and prismatic women well before their time. Do you have upcoming offerings with strong women in the lead? Next season we have some great female characters – Marguerite in Faust; the Queen of the Night and Pamina in The Magic Flute; and Violetta in La Traviata. These roles are all cast with wonderfully strong actresses with great voices, but the characters themselves have some issues they all could work on! Maybe they need opera therapy! (Laughs.) Honestly, I think Marian Paroo from the The Music Man, which is our musical next season, is the best character example of a strong woman. Harold Hill thinks he’s pulling off a scam, but she knows all about it. She’s really holding the cards and playing them well. In the end, she gets her man and helps him become a better person and the whole town is happy except for maybe the mayor. Will you be working with Susan Hellman Spatafora again? Yes, she has a principal role in the upcoming Tales of Hoffmann by Offenbach. In the opera, the character of Hoffmann tells the story of his misfortunes with three different women; Susan plays Giulietta, the heroine of the Venetian Act. Also, it is very exciting that the DVD of our production of Susannah by Carlisle Floyd that starred Susie in the title role was just released by Naxos on May 12. The Palladium has become an intimate, acoustically marvelous venue to see operas. What feedback have you received about the historic venue? We are very pleased with the special style of opera we have created and developed at the Palladium. The singers love to sing in the Palladium and with the orchestra onstage and in proximity to the voices, there is a high level of musical collaboration constantly taking place. Our subscribers feel close to the action in the 800-seat theater, and they tell me they love the acoustics. We will continue with five mainstage (subscription) events next season – three operas, one musical and the Seasonal Sparkle. We are also planning projects with the school system. Third graders will be bussed to Opera Central to see Pinocchio — a children’s opera — in November, and we will be offering three Pinocchio performances to the public. We are also going into the schools to make general opera presentations to the students. In your Creative Loafing/Ask the Locals interview, you mentioned that you were reared by a NASA engineer and Auburn professor. Did you grow up in Alabama? I grew up in Auburn, Alabama. My father was a rocket scientist and taught aerospace engineering at Auburn University the last 20 years or so of his career. How did your family life influence your path as a musician and conductor? I am the youngest of seven. My oldest brother passed away, which may have been why the “six” ended up in the previous (CL) article. My brother, Andy, who is seven years older played the piano and trombone. I attribute my interest in playing musical instruments to him. He was a great role model in so many ways. I loved playing the bassoon and won the principal bassoon position with the Florida Orchestra when I was 22. My parents were so supportive of my artistic endeavors and often made trips down to hear the orchestra and in later years the operas I was conducting. I’ll also add that my brother, Andy, and sister Suzanne, both frequently makes trips down from New York City to see the St. Pete Opera or Tampa Bay Symphony. I think I can say I’ve been very blessed with family support. When can we see you Hula Hoop again in the future? I don’t know about that one. I last appeared doing that in Die Fledermaus in 2011. Maybe I would perform again as a hula hooper for a fundraising cause.